Even as all indications point to an ultimate showdown with his own brother-in-law for the mayorship of Iloilo City in the May 13, 2019 local elections, Cong. Jerry P. Trenas continues to hope that City Mayor Joe Espinosa III will “be guided by the Holy Spirit” and realize that their unity will enable them to sustain the gains of the last eight years. In an interview Friday night (June 29), Trenas explained that his decision to return to the political arena after announcing his retirement in December 2016 came after the dismissal of then City Mayor Jed Patrick E. Mabilog late last year. “The equation suddenly changed, and the triumvirate that enjoyed the series of political victories had a missing leg,” Trenas said. Trenas said the circumstances was different at the time he made the announcement. “I wanted to preserve the unity of our group, and since my third term as congressman was ending in 2019, there was no place for me to go, as the positions that will be vacant are City Mayor and Congressman. Our plan was to field Jed as congressman and Joe III as city mayor,” Trenas said. The wives of Trenas and Espinosa are sisters. But the unexpected dismissal of Mabilog as city mayor in October 2017 changed the picture. He felt there was a need for him to return to the political arena as City Mayor while Joe III can make the move to the congressional seat he was vacating. “There’s now a place for both of us,” he said. Trenas brushed aside accusations that he had broken his word. If Mabilog was not dismissed, he would have stuck to his commitment as he did not want to destroy the unity of their group, he said. Right now, Trenas said he is still holding off a decision to pick who will run as congressman under his ticket to give time for Espinosa to change his mind and reconcile. Two former city councilors, Lex Tupas and Jamjam Baronda, have signified their interest in running for the House with him. Trenas said he has asked the two to keep going around the city to meet with local leaders and gain their trust and confidence. If Joe III doesn’t change his mind, then he will pick from one of the two, he said. There are as yet no signs that the strained relationship between brothers-in-law (their wives are sisters) Iloilo City Mayor Joe Espinosa III and Congressman Jerry P. Treñas over their political plans for 2019. While both politicians seem to have turn down the volume on the dispute, each side is trying to consolidate their forces by going down to the barangay level and talk with the leaders. Two days ago, Espinosa met with barangay captains in the Jaro district over coffee. A few days before, Espinosa had also scheduled a meeting with barangay captains from Mandurriao. However, the meeting had to scrapped at the last minute when the city mayor got wind of their plans to snub his invitation. This morning, it was the turn of barangay captains from Lapaz to sit down with Joe III for coffee. Based on information I have gathered, these meetings put a lot of pressure on the barangay captains. Many didn’t want to appear disloyal to Trenas by joining the city mayor for coffee. My contacts told me the meetings didn’t dwell on politics. Joe III deliberately steered the discussion away from politics. Trenas also went on his own sorties down to the barangay level, meeting with officials, senior citizens and other leaders. The congressman is now serving a 90-day preventive suspension handed down by the Sandiganbayan in connection with alleged violation of COA rules and regulations in the disbursement of funds to the Iloilo Press Club more than 10 years ago. He’s got plenty of time to go around. From the looks of it, Trenas enjoys the upperhand if barangay captains and kagawads are concerned. Those who did attend the coffee chats with Joe III wanted to tell the city mayor that they want to see the brothers-in-law patching up their differences and run together as they have in the past — Jerry as city mayor, and Joe III as congressman. However, not a single one of them was able to do that, according to my sources. Joe III did not allow them to talk about the possible showdown in 2019. What is intriguing about this deteriorating relationship between Jerry and Joe III is the possible cause of it all: sibling rivalry. Their wives are sisters. I think it was Novie Guazo of RMN 774 who insinuated that this is becoming a battle of first ladies. It’s obvious much will depend on how the sisters — Rosalie (wife of Jerry) and Gina (wife of Joe III) — navigate this turbulent sea of local politics. The political season has definitely started for Iloilo City. Last week, Long District Cong. Jerry P. Trenas, although still serving a 90-day preventive suspension from the Sandiganbayan, met with barangay officials and other grass-roots leaders in an apparent effort to get his political machinery warmed up. For several days, his office beside the Iloilo Fire Station was crowded with people from all walks of life. He reiterated his announcement about running for City Mayor once more and asked for their pledge of support. These meetings were buttered by P500 for each individual as “allowance”. On the other hand, City Mayor Joe Espinosa III also convened a meeting of job hires — the backbone of the political juggernaut for as long as we can remember — with a similar agenda. The job hires, which usually reach a peak of 5,000 people during an election year, were reminded on where their continued stay in City Hall depended on: the appointing authority. This is rather amusing because all these happened as everybody else just sat still, waiting for developments to unfold. There was hardly a stirring in the “opposition camp”. The general mood was “wait-and-see” as this quarrel between brothers-in-law unfolded. Will this cold war worsen and ignite an all-out war between erstwhile allies? Or will cooler heads succeed in repairing the relationship which used to look like a Batman-and-Robin partnership? Meanwhile, there are politicians waiting in the winds, waiting for cues as to what they will do next. Vice Mayor Jeffrey Ganzon, former Councilor Lex Tupas and former Councilor Jam-Jam Baronda are among those eyeing either the mayorship or congressional seat. Their decisions will depend on how this quarrel between Trenas and Espinosa will play out. If a collision is inevitable, then Tupas and Baronda can aspire for the congressional seat. They would just need to ally with one of the two factions. Ganzon, although he is perceived to be the strongest aside from Trenas and Espinosa, lacks the financial capability. I would not be surprised if he is recruited as running mate by either one of the two. Ganzon would be the favorite for vice mayor in 2019 if that happens. Is the relationship between City Mayor Joe Espinosa III and Congressman Jerry Trenas now beyond repair? This question is now being asked by most people in Iloilo City after eight Executive Assistants identified with Trenas reportedly resigned on Monday after reportedly being asked about where their loyalties lay. The version of Joe III is that the city mayor called for a meeting with his executive assistants on Friday morning, but nobody among the Trenas-identified assistants showed up. In the afternoon, they were summoned by Senior Executive Assistant Jojo Castro and were given a gentle reminder about being loyal to the service, and not to any politician. The Executive Assistants gave a different version: Castro reportedly told them to choose between Trenas and Joe III. This is what triggered their move to file their resignations, so their version goes. But whatever really happened, this episode is an indication that the relationship between the brothers-in-law is not improving. It turned from bland to sour. The apparent falling out is being interpreted by most people as a sure sign the “magbilas” are headed to a showdown for the mayorship in 2019. Trenas has announced last week that upon the egging of most barangay captains in the city, he decided to run again for city mayor in next year’s elections, a move that didn’t sit well with Joe III. As the incumbent local chief executive, Joe III feels he deserved to have a say on who was running for what position. Joe III felt that Trenas couldn’t just presume to be the kingpin everybody would just obey on political decisions like this. The unfolding events caused a lot of excitement among local political figures who sensed that a head-on collision between the “magbilas” was going to open opportunities for them. A combined political machinery of Trenas and Joe III (the latter just having put his own imprint on the political landscape after he succeeded to the mayorship five months ago) would be formidable. If they could agree on running together, almost nobody has a fair chance of surviving the political juggernaut they could deploy. The dismissal of Jed Patrick E. Mabilog as city mayor last October meant that the political game has become, or could be, a family affair. The classic “divide-and-conquer” principle is clearly on everybody’s mind with what is happening. That’s the reason some are encouraging it, adding fuel to the fire. I’m not inclined to believe the brewing quarrel will not be resolved. In the end, the interests of the family will triumph over personal and petty issues. The issue here is about respect, or the perceived lack of it, shown by one toward the other. Trenas and Joe III are tied by a powerful umbilical cord — the Sarabia family. This is the reason why the voices now emerging from both camps are now starting to be more sober, less provocative. But should the situation not change, and get worse, then it presents a ripe opportunity for other political figures to rise to the occasion. I would expect these politicians to form alliances with either Trenas or Joe III. 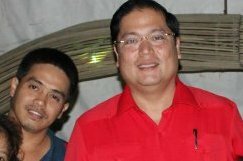 If the “magbilas” collide for the mayorship, then the congressional seat for the lone district will become open season. Is the rift between City Mayor Joe III Espinosa and Congressman Jerry Trenas real? Until now there are still doubts as to how deep this quarrel is, especially after executive assistants identified with Trenas were asked to step down from their posts last week. Even I wasn’t so sure, knowing how far back the relationship between Joe III and JPT is. Both went into politics together, and nothing has come between them. Well, until recently. It seems JPT has misjudged Joe III. All these years, Joe III has played the role of loyal political lieutenant, just contented with whatever role his “bilas” gave him. In 2010, JPT and Joe III, along with Jed Patrick Mabilog, formed the backbone of the political juggernaut that seemed destined to rule Iloilo City for a considerably long time. But even as early as 2013, the question was where would Joe III go after JPT and Jed finished their third term in 2019. A rigodon was expected to take place in 2019 with JPT and Jed switching positions, with Jerry reclaiming the city mayor position and Jed taking over as congressman. A solution suddenly arose last year when JPT announced he was quitting politics. This removed a potential conflict because Joe III could then run for city mayor and Jed to become congressman. Everything seemed headed for a smooth transition for the “Uswang, Sulong and Arangka” team. Then, Jed was dismissed from public office based on two cases I had filed a few years ago. With JPT no longer in the running as he declared, and Mabilog out for good, the coast was clear for Joe III to take. He was now City Mayor, and he started planning for his eventual election to the position to which he succeeded. The game plan looked so simple. With JPT backing him up, Joe III seemed to have the position as City Mayor on a silver platter. What the public didn’t know was that the relationship between the two in-laws was starting to deteriorate. Despite their affinity — their wives are sisters — JPT and Joe III haven’t communicated with each other for quite some time now. Perhaps JPT regarded Joe III as the political lightweight who depended on him for his continued survival and thought the new mayor would just obey his every command. Joe III must have felt he deserved some respect. After all, he was now the City Mayor. He was no longer the “sidekick” who just followed what the boss dictated as to his political future. The first time the name of Jesus “Jing Jing” Espinosa came out in the news happened sometime in 1993 when he was accused of murdering a deaf-mute who had done nothing to provoke him. Jing Jing, as he is popularly known, happened to pass by when the victim, Augusto Elon, was urinating in front of their house. He shot him three times at close range. The victim died instantly. Jed is a frequent visitor to Jing Jing Espinosa’s residence in Barangay Monica. He is a godfather to one of Jing Jing’s children. The Regional Trial Court of Iloilo found Jing Jing guilty of murder and sentenced him to 10-17 years in prison. After serving his prison term, Jing Jing returned to the “waterfront” area in Barangay Monica. Sources in the Philippine Drug Enforcement Agency (PDEA) said Jing Jing became friends with a known drug lord while he was in jail. They became business associates upon getting out of jail, the sources said. “Jing Jing is now a big-time drug lord in Iloilo City,” said a relative in Barangay Monica. His house there is almost like a tower overlooking the waterfront area. It is five stories tall. In June 2010, Jing Jing’s name again hit the news when a relative, Pascual “Toto E” Espinosa and his brother, Leo, were ambushed on Zamora St., City Proper. “Toto”, a former executive assistant at City Hall during the Malabor administration, suffered wounds but survived. Jing Jing was accused as the perpetrator. When the case was filed before the City Prosecutor’s Office, Jing Jing asked that the entire prosecutor’s office be inhibited from handling the investigation. The case is still pending before the Department of Justice. That was the second time “Toto E” was ambushed, allegedly by Jing Jing. In an earlier incident, “Toto E” suffered scratches after his relative allegedly fired at him near a church in the waterfront area. According to sources, Jing Jing was also convicted of the crime of frustrated murder. The conviction is pending appeal before the Court of Appeals. Jing Jing is described as a very violent individual. His rise as a drug lord has enabled him to control the entire waterfront area and keeps the police force assigned to the area under his beck and call, according to another relative interviewed for this article. Because of this, the police is virtually helpless in stopping crimes taking place in the area. One resident said there is hardly a night when there are no gunfire bursts to shatter the quiet evening; the police could do nothing about it, she said. 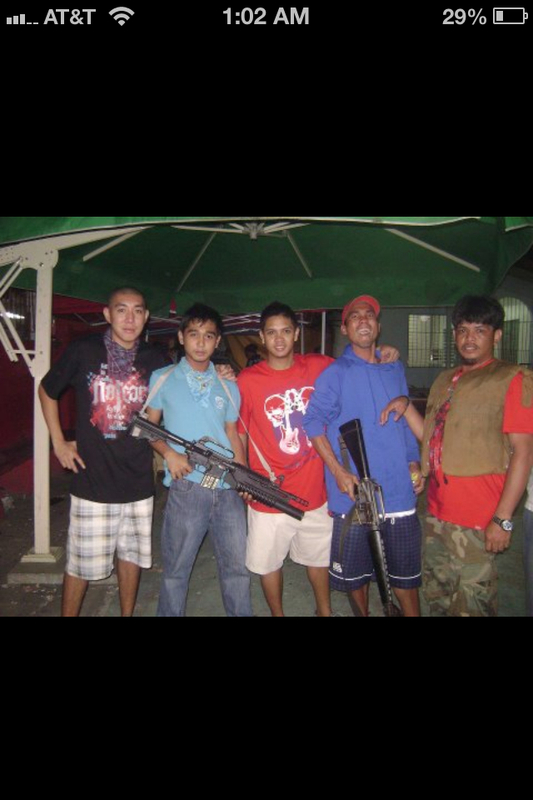 Jing Jing Espinosa has his own private army in Barangay Monica, armed with heavy firepower. When Mabilog and Trenas visit him, even barangay tanods are issued machine pistols to beef up security. “Jing Jing is untouchable in the waterfront, and this is largely because of his close friendship with Iloilo City Mayor Jed Patrick E. Mabilog,” an informant in the area said. Mabilog, the informant said, is a frequent visitor to Jing Jing’s house. This information is validated by the numerous photographs that surfaced over social media networks these last few days showing Mabilog and Jing Jing together. “Mabilog is the godfather of one of Jing Jing’s children,” said another source. “Mag-kumpare sila,” he added. When Mabilog was asked about his association with Jing Jing, he told local media there was nothing wrong with it. He even dismissed the issue as “non-sense”. But the spread of the photographs showing Mabilog and Jing Jing on intimate terms shows many Ilonggos are bothered by this friendship. Former Iloilo City congressman Raul Gonzalez Jr. sent a text message that in Davao City, drug pushers flee upon seeing the approach of former City Mayor, and now Vice Mayor, Rodrigo Duterte. “In Iloilo City, our city mayor and congressman (Jerry P. Trenas) even wine and dine with drug lords,” Gonzalez said. One of the photographs that circulated on the Internet also shows Trenas, along with Vice Mayor Joe Espinosa III and Liga ng mga Barangay federation president Bobby Divinagracia, enjoying a meal with Jing Jing. There are worries that the intimacy between Mabilog and Jing Jing is the reason the illegal drugs problem has flourished in Iloilo City. “Mabilog has kept a tight rein on law enforcement authorities and prevented them from pursuing drug pushers in the city,” one police officer, who asked not to be identified, said.